The new Novation Launchkey Midi Controller is a powerful integrated hardware / software instrument for users wanting to have keyboard input for Ableton Live. The keyboard controller comes in 25, 49 and 61-key versions. 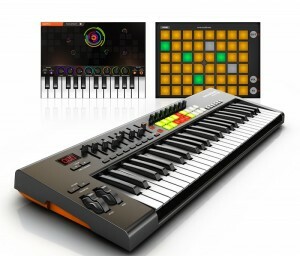 The Launchkey features Ableton Live Lite, DAW Control, bus-powered, 16 velocity-sensitive multi-colour launch pads, the Launchkey application (an iPad performance synth) as well as a Launchpad application that provides drag-and-drop loop playback from the pads and real-time effects including stutter and filter effects. The Novation Launchkey is a fully featured DAW control surface with over 50 hardware controls – 34 on the 25 -key version. In addition to the integrated instrument functionality and Ableton Live, the 16 velocity-sensitive dual-colour backlit launch pads can be used to play drums and trigger loops. Thus, the Midi Controller has more hands-on control than any other device in its class. An ideal partner for a DAW, giving you instant control of track volumes, panning, sends and other settings with Novation’s InControl software integration system. Setting up is a breeze. The Novation Launchkey 49, 49-key USB/iOS MIDI Keyboard Controller with Synth-weighted Keys is more than just for iPad and Live users. 2013 NAMM Show: Introducing the Moog Sub Phatty Analog Synthesizer. The latest member of Phatty Family is the Grittiest Moog Synth Ever. Additionally, the new two-oscillator analog synthesizer will be Moog’s most affordable keyboard synth. The soul and hands-on, real-time sound design functionality of vintage Moog instruments with a completely new – and stunningly aggressive – sound design machine. Fitted with 25 full-size synth action keys, LFO, and legendary Moog ladder filter, 16 presets with panel mode, and a 31 knob front panel, Moog’s classic control design plugs you straight into the analog heart of this powerful new instrument. The Sub Phatty is the first analog synth to feature Moog’s transformative new Multidrive section. Built into the filter section, the Multidrive circuit drives (or enthusiastically overdrives, depending on how you set it) the filter, for rich and powerful effects. The good news is that with the Sub Phatty, the variable, pre/post-filter Multidrive lets you dial up everything from gnarly, classic grit to sizzling modern distortion. Experiment with this new circuit and unlock an undiscovered world of vivid analog tonalities. The Legendary Ladder Filter onboard – The Sub Phatty’s ladder lets you dial in your optimal filter cutoff frequency and tweak the resonance to create classic fat ‘n’ punchy Moog sounds. Want to modulate your filter resonance? The Moog Sub Phatty’s onboard LFO lets you modulate without having to commandeer one of your sound generating oscillators (as on vintage Minimoogs). Get creative with key-synched filter sweeps and more, for delectable, swirlicious sounds that will enhance your productions with authentic Moog analog goodness. The Moog Sub Phatty sports control voltage and keyboard gate inputs that allow you to connect your new Moog with your vintage or any other gear that has CV/gate connectivity. The Sub Phatty sports Filter CV, Pitch CV, and Volume CV, as well as Keyboard Gate connections, putting you firmly in the control seat. And of course, you get MIDI DIN In and Out, as well as MIDI over USB for communication with your DAW. 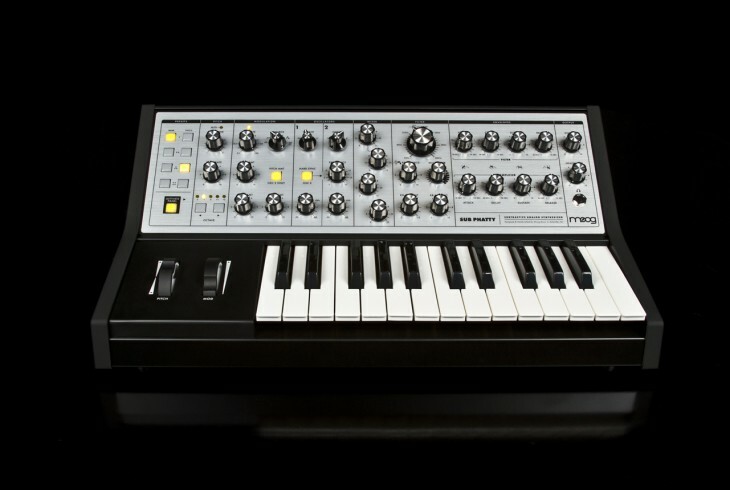 If you are looking for an affordable, compact Moog mono synth, the Moog Sub Phatty – Go for it!